Alexander McNair was an American frontiersman and politician. He was the first Governor of Missouri from its entry as a state in 1820, until 1824. McNair was born in Lancaster, Pennsylvania and grew up in Mifflin County, Pennsylvania. His grandfather, David McNair, Sr., immigrated to Pennsylvania from Donaghmore, County Donegal, Ireland around 1733 and had Scottish ancestors from Loch Lomond. 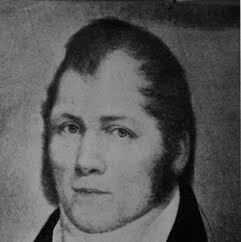 David McNair, Jr., Alexander's father, fought with General George Washington in the Trenton and Princeton campaigns in the winter of 1776–77, and died in February, 1777 as a result of wounds received in battle and exposure when Alexander was less than two years old. Alexander went to school as a child, and attended one term at the College of Philadelphia. He reached an agreement with his mother and brothers that the brothers would have a boxing match and that the winner would receive the father's property. Alexander was defeated. He became a member of the Pennsylvania militia and fought for the government in the Whiskey Rebellion in 1791 and 1794. In 1804, McNair traveled to what is now Missouri, the United States having just acquired it following the Louisiana Purchase.